When Manchester United were relegated in 1974, just six years after winning the European Cup, it was front page news. How could such a thing happen to the biggest club in Britain? Such a scenario would be even more unthinkable today than Leicester City winning the league. The story is one of the most dramatic in football history and yet, still, largely unexplored. 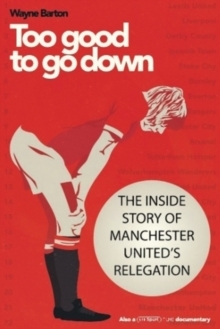 Based on a BT Sport film being developed alongside the book, TOO GOOD TO GO DOWN examines the demise of Manchester United, from the moment Bobby Charlton described the club not winning Division One in 1968 as the best thing that could have happened, through the turbulent reigns of Sir Matt Busbys successors, to the crushing blow of relegation which, ironically, came at a time when the clubs young team were just about to bloom and win over a whole new generation. With brand new, in-depth and exclusive interviews with Tommy Doherty, Sammy McIlroy, Alex Stepney, Stuart Pearson, Lou Macari, Pat Crerand, Willie Morgan, Gordon Hill, Martin Edwards and Paddy Barclay, the most controversial story in the history of footballs biggest institution is fi nally told in full detail.